Let’s face it: Nobody likes their job anymore. For the past few years, those of us lucky enough to punch a clock have clung to our job like a leaky rubber raft in a sea of economic uncertainty. We keep waiting for a bigger, better boat to rescue us, but none ever do. Meanwhile, our raft has started micromanaging us. “Don’t stand up and look around,” it nags. “Just be happy you’re here,” it says. “Make sure those TPS reports are collated in alphabetical order,” it demands. It’s enough to make you yearn for the sweet release of drowning. With its main plot centering around the unthinkable—well, maybe not unthinkable, but undoable—act of murdering your boss, the comedy Horrible Bosses expertly taps into this universal vein of discontent. It offers the viewer the kind of violent thrills that are usually the purview of postal workers and mutinous pirates. While it’s not the funniest movie of the year, it’s a worthy excuse to take some of the money you’ve earned at a job you hate, throw it at cinema cashier who also hates their job and bathe yourself in air conditioning and belly laughs. 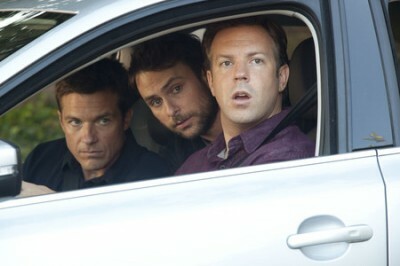 Horrible Bosses jumps right into things with its fun-yet-perfunctory introduction to the characters and their jefes horribles, all of which make your creepy, garden variety micromanagers look downright desirable. Nick (Jason Bateman) is an underling to the sadistic Dave Harken (Kevin Spacey); Kurt (Jason Sudeikis)’s paternal boss (Donald Sutherland) turns road-kill before his very eyes, leaving his coke-addled, comb-overed son (Colin Farrell) to take control of the company; and the newly-engaged Dale (Charlie Day) gets more sexual attention from his boss Dr. Julia Harris (Jennifer Aniston) than a female army private stationed at Bagram Airfield. Horrible Bosses strengths lie with its universal theme and top-notch cast: In addition to the highly capable main players named above, Jamie Foxx, Julie Bowen (“Modern Family”), Ron White and even Bob Newhart show up and lend the flick some serious comedy pedigree. It’s a good thing, since the writers, a quartet of guys who have mostly worked on hit and miss television shows like “Becker” (not funny), “It’s All Relative” (huh?) and the animated “Duckman,” created little more than caricatures (albeit funny and likable caricatures) instead of characters. Luckily, as the outtakes during the end credits reveal, director Seth Gordon allowed the cast to do a lot of improvising. In short, the film’s more cliché than clever, but its Herculean cast and its universal truths make it enjoyable summer comedy fare. Hopefully, in a few years, we can abandon this theme and go back to enjoying comedies about the wacky pitfalls of economic prosperity.